Photo credit: Princeton University Library - StellaBloch PapersRelating to Ananda K. Coomaraswamy (C0822) Manuscripts Division, Department of Rare Books and Special Collections, Princeton University. As part of the Dhaka Art Summit Symposium, The Sunwise Turn. Image courtesy of the Dhaka Art Summit. Photo credit: Noor Photoface. The Sunwise Turn took Ananda Kentish Coomaraswamy’s seminal 1927 publication, A History of Indian and Indonesian Art as a starting point and meditated upon three political ideas that have marked the writing of art histories in the 20th century: industrial, modern and region. Constructed around Coomaraswamy’s writings in the backdrop of anti-colonial struggles of the inter-war years and his curatorial work at the Museum of Fine Arts, Boston, the symposium sought to examine the interventions his thoughts made into the self-consciousness of Western modernism. Bringing together international voices from art, theory, history, and philosophy, the workshop is conceived as a series of propositions linking Coomaraswamy to the sentiments of his time, but also to the gradual curve of their evolution today. The Sunwise Turn, was a critical circumambulation around the philosopher, curator and historian. It picked up the phrase from an oft-overlooked bookshop, which became the centre of anarchist political thought in New York City just after the first World War, a place that Coomaraswamy not only came to be closely associated with, but evoked as “the storm of the world-flow”. The Sunwise Turn took Ananda Kentish Coomaraswamy’s seminal 1927 publication, A History of Indian and Indonesian Art as a starting point and meditated upon three political ideas that have marked the writing of art histories in the 20th century: industrial, modern and region. Constructed around Coomaraswamy’s writings in the backdrop of anti-colonial struggles of the inter-war years and his curatorial work at the Museum of Fine Arts, Boston, the introductory remarks sought to examine the interventions his thoughts made into the self-consciousness of Western modernism. One methodological approach that this paper sought to engage with was that of an “alternative geography” that Coomaraswamy puts forwards in A History of Indian and Indonesian Art, where he seeks to understand cultural production in Asia not through the tried lenses of 'influence' and 'borrowing' but through the steady proliferation of 'cognates', i.e. the study of connections and lateral links between different sites. This paper also tracked some of the critical secondary literature that has emerged on Coomarswamy in the last three decades from the Indian subcontinent where much of his work remains canonised and contested from beyond the subcontinent, especially the United States of America where newer lines of inquiry are emerging on his thoughts and impact as a curator of Asian art. Overall, the remarks offered thoughts about the rationale in bringing together international voices from art, theory, history, and philosophy and how The Sunwise Turn linked Coomaraswamy to the sentiments of his time, but also to the gradual curve of their evolution today. Ananda Coomaraswamy resided in Ceylon between 1902-1907. Based on this experience, his first major book, Mediaeval Sinhalese Art was self-published with great care in a luxurious limited edition in 1908. It contained a great amount of original research carefully detailing technical and cultural information, which remains valuable today as an indispensable guide to traditional crafts of Kandy. Mediaeval Sinhalese Art engages with the problem of translating the legacy of William Morris and the British Arts and Crafts movement into the colonial context. This paper argued that the book is caught between a historical recreation of 'mediaeval' Kandy, and an anthropological and historical description of craft processes. Coomaraswamy’s paradoxical account is the result of a necessary 'mistranslation' of the 'mediaeval,' as carried over from industrial Britain into a colonial site. The consequences of this maneuver are both textually and photographically incorporated into Mediaeval Sinhalese Art, in which the artisanal figure oscillates between a dying anthropological specimen on the one hand, and an already deceased and thus a spectral figure on the other. This paper traversed a genealogy of perspectives that bear strongly on the categories of the 'folk', 'tribal', 'rural', 'national' and 'modern', which have shaped our discourse around what constitutes the contemporary in postcolonial Indian cultural production. Certain tropes, figures, sites and themes recur in this discourse: the village, regarded variously as the site of native and pre-modern authenticity, pre-industrial backwardness or cultural wholeness; the figure of the artisan, variously conceived as an organic bearer of holistic cultural values, a poor relation to the metropolitan and academy-trained artist, or as a scripturally sanctioned producer of culturally significant icons; the 'folk' as the pre-national repository of collective consciousness that assured its members of identity and belonging in a locale; the 'tribal', either stigmatised as a rustic figure without access to cultural capital, championed as a subaltern victim deserving of developmental assistance, or idealised as a cultural subject rooted in the specificities of a local environment. Above all, it is 'authenticity' that persists as an anxiety in this discourse. As such, it becomes the ground of claims exerted by numerous forces, including the Hindu right wing, aggressive modernisers, resurrectionists of the crafts, and progressively oriented thinkers who wish to invest contemporary artists emerging from these backgrounds with agency. This paper revisited a series of debates staged across the 20th century in India, and which involved such participants as the cultural historians E B Havell and A K Coomaraswamy, the anthropologists G S Ghurye and Verrier Elwin, and the political thinkers M K Gandhi and B R Ambedkar. In doing so, it demonstrated that the debate over the 'vernacular in the contemporary' is both about an aesthetic self-assertion and a choice of artistic form, as well as a demand for the redistribution of social equity and the securing of participatory citizenship for India's subaltern communities. A.K. Coomaraswamy remarked that nothing of artistic value had been produced in 19th century India, and that modern Indian architecture was “at its very lowest ebb.” Overcoming this degraded condition necessitated learning the forgotten 'art of living.' Where was this lost art of living to be found? In the art schools, in the village community, in colonial cities, or among the educated classes? In this paper, Chattopadhyay looked at the ethical implication of location/space in the work of Abanindranath Tagore and Nandalal Bose that engaged with and critiqued Coomaraswamy’s vision of cultural regeneration in everyday life. This paper gave an overview appreciation of A. K. Coomaraswamy in Japan. Kakuzo Okakura (also known as Tenshin Okakura), author of The Book of Tea (1906), might have had a chance to see Coomaraswamy in London. Okakura’s attempt at constructing Asian Art History as an idea has been accomplished by Coomaraswamy as curator at the Museum of Fine Arts in Boston. British rule of India may find a parallel in Japan’s colonial rule over Korea. In this context, Muneyoshi Yanagi, founder of the Popular Crafts Movement in Japan, is worth comparing with Coomaraswamy. Yanagi’s medievalism, inspired from his Korean experience, may shed new light on Coomaraswamy’s view of arts and crafts. Both Yanagi and Coomaraswamy have shown affinity with William Morris, though their encounter did not bring any fruitful outcome to the posterity. And yet, the friendship between Takumi Asagawa and Gurcharan Singh in their pursuit of ceramics in Korea and India cannot be overlooked. The merging of Oriental religious experience and aesthetics is another common feature between Yanagi and Coomaraswamy. Just like Coomaraswamy’s relation with Rene Guenon and Mircha Eliade, Yanagi was closely related to D.T. Suzuki. As an epilogue, and in token of Coomaraswamy’s legacy, this paper touched upon Fuku Akino, a Japanese woman painter who took special interest in decorations made by women in Kacchi, Gujarat. With Iftikhar Dadi, Nancy Adajania, Swati Chattopadhyay, Shigemi Inaga and Shabbir Hussain Mustafa. In early 1917 Ananda Coomaraswamy arrived in New York from Britain under trying circumstances. Agitation for India’s independence from colonial rule, coupled with his outspoken opposition to Indian involvement in the British war effort, had led the authorities to regard him as a dangerous subversive, better expelled than tolerated. Upon arrival, however, he found a ready audience for his views among New York’s anarchists. Plunging into that milieu, Coomaraswamy would contribute a series of articles to the anarchist Modern School journal and codify his own variation of anarchism for an American audience in The Dance of Siva (1918). Coomarawamy’s involvement in, and impact o,n the movement in America was multifaceted; his concept of 'idealistic individualism' influenced the arts; his calls for 'post-industrial' social transformation resonated with critics of capitalism; his 'cosmopolitan' interpretation of Frederick Nietzsche’s philosophy captured the imagination of theorists; and his anti-colonial condemnation of World War One struck a strong chord among revolutionaries. This paper explored this pivotal moment in Coomarswamy’s career through a rich network of activists, artists, cultural centers and publications. Stella Bloch was an artist, dancer, and writer whose emergence on the New York art scene unfolded during tumultuous and exciting times during the later years of World War One. A self-taught artist and performer, Bloch initially drew her inspiration from the revolutionary dancer Isadora Duncan, but also sought out other performers to capture on the page. In 1917, she was attending a recital of the performing duo Roshanara and Ratan Devi where she met Ananda Coomaraswamy. That evening she showed him some of her drawings, which would mark a significant turning point in her life. 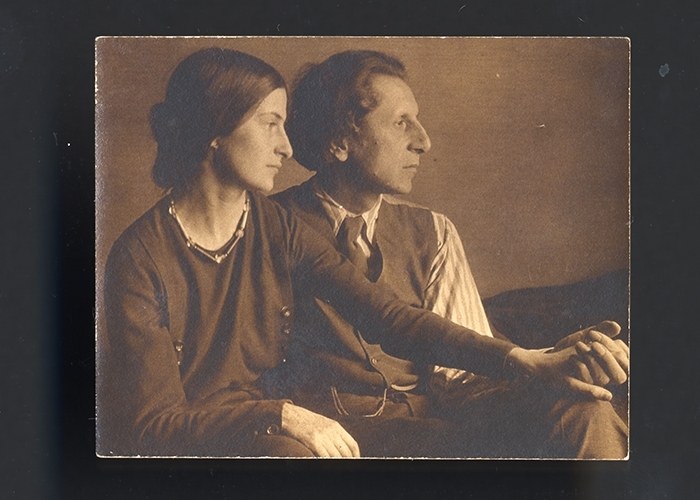 Coomaraswamy soon became her mentor and her lover. Shortly after meeting Coomaraswamy Bloch made her acquaintanceship with Isadora Duncan’s six proteges, began practicing with them, and drew further studies of the dance from observation and from memory. In 1920, Coomaraswamy invited Bloch to join him on a museum purchasing trip to Japan, China, India, and Indonesia. There, Bloch was inspired by the performance traditions of Java and Bali, where she had an opportunity to closely study the art forms. Upon her return home to New York, she embarked on a new direction as a dancer, now performing in the manner of the Javanese dances she saw while on her journeys. This presentation of Stella Bloch offered an overview of Bloch’s art and dance, as well as an analysis of two texts by Bloch: “Intuitions” published in the Modern School Journal in 1919, and Dancing and the Drama, East and West, a booklet in which Bloch concluded Eastern dances to be superior to those in the West, for their value as cultural traditions rather than as ‘mere’ entertainment. As well as introducing the West to Asian art, Ananda K. Coomaraswamy also helped introduce the West to Asian religion, not as something remote and distinct from Western religion, but as an instance of that core religious truth that is "the common inheritance of all mankind." Coomaraswamy came to understand common, core religious truth in terms of what the Franco-Egyptian philosopher and metaphysician René Guénon (1886-1951) called “tradition,” itself a form of the “perennial philosophy” hat had interested Western thinkers and esotericists since the Renaissance. Coomaraswamy in turn changed the understandings of Guénon and of other “Traditionalists,” both by adding a certain academic rigor to their work and by convincing them to accept Buddhism as a valid expression of tradition, along Hindu Vedantism, Islamic Sufism, and Late Antique Neoplatonism. This paper placed Guénon’s Traditionalism within its wider context and examined both Traditionalism’s impact on Coomaraswamy and Coomaraswamy’s impact on Traditionalism. This included an abiding emphasis not only on Buddhism but also on traditional arts, reflected for example in the activities of the Prince’s School of Traditional Arts, founded in 2004 by Great Britain’s Prince of Wales. With Allan Antliff, Kim Croswell, and Mark Sedgwick. Many years ago, I was surprised at how two bearded Brahmin scholars, namely Ananda Coomaraswamy and Rabindranath Tagore, exchanged thoughts on art, nature and time. Since then, my curiosity has evolved towards the philosophies of these two great scholars. I studied at Santiniketan, the school founded by Rabindranath Tagore, where I tried to grasp his ideas about nature and education. Coomaraswamy entered my life much later. My paper explored the idea and philosophy of art and nature in the context of the pre-independence period. I inquired how the ‘modern’ came to be negotiated between these two figures while trying to unpack the historical context as discussed and perceived by Tagore and Coomaraswamy, as I feel their thoughts are relevant today. Neither of these thinkers believed that art and nature belonged in a museum but attempted to associate the aesthetic closely with everyday life, in which nature too plays an integral part. My presentation also looked at the thoughts of Swami Vivekananda and Sister Nivedita and the way they resonated with art, because without their journey, Coomaraswamy and Rabindranath would not be complete. In what ways can the intellectual horizon of the diaspora be triangulated? How do they demonstrate a global connection that is not strictly formed by a movement from East to West? Can this multi-centre story complicate our commonplace understanding of what kind of 'worlding' did historiographical projects produce outside of the academia? This paper considers the life work of Ceylonese Malaysian Durai Raja Singam, who corresponded briefly with the esteemed scholar of Indian art history and curator at the Boston Museum of Fine Art, Ananda K. Cooramaswamy, in the late 1940s. Durai Raja Singam later became one of the most obsessive biographical compiler of Coorasmaswamy’s life and work. Towards this end, he had self-published some of the most idiosyncratic yet valuable books, often filled with memorabilia, photos, excerpts, newspaper clippings, graphs and charts that aimed at preserving for posterity the profile of Cooramaswamy as one of the most renown scholars on Indian art and spirituality, alongside recognition of Coomaraswamy's greatness as a scholar-saint for the Sri Lankan Tamil diaspora. In this paper I considered Durai Raja Singam’s building of an archive and self-publishing initiatives in relation to the spiritual use of print technology. Though premised on a language of devotion, the life work ultimately attempts to construct an intellectual memory through the use of allegory. In this sense, these publications circulate a form of intellectual, cultural and moral resistance amongst the Sri Lanka Tamil diaspora in a time of civil war as ethnic tensions between the Tamil and the Sinhalese communities were heightened following the independence of Sri Lanka. The crafts’ discourse serviced a complex web of imperialist, nationalist and capitalist agendas between the metropole, colony and indirectly-ruled British India from the 1820s to the first half of the twentieth century. The nationalist ideologue within A.K. Coomaraswamy’s writings on Indian art in general and The Indian Craftsman (1909) in particular, furthered two aims: one was to educate the colonial state on the different standards of Indian art; the second was to champion the cause of the disadvantaged artisan by furthering a protectionist discourse to preserve caste-based guild systems and their contexts of production in what was viewed as a coherent, timeless Asian tradition against the aesthetically failed experiments of a rapidly industrialising Britain. For all its emphasis on timelessness, authenticity and anti-industrialism, equally national-minded crusaders such as Maharaja Sayajirao III of Baroda steered the cause of the craftsman with a reformist slant. This paper problematised Coomaraswamy’s writings by juxtaposing Baroda’s pragmatic experiments which yielded an alternative paradigm of traditional crafts, technology and capital. Close archival reading of Baroda State’s polytechnics, workshops and loans to international exhibitions and firms, not only points to a modernising narrative of the crafts but also illuminates Baroda’s participation in a global system of production and taste-making. By underlining a series of ironies and paradoxes, this paper highlighted how protectionism and reform actually co-opted each other in the space of exhibition and publications. Quite contrary to the “Boston-based giant’s” idyllic picture of the craftsman as pre-modern, provincial Baroda demonstrated the craftsman’s readiness to unhinge caste-based categories and participate in new systems of technical education, workshop-style production and metropolitan capital and technologies. Despite their seemingly conflictual strains, in the end, both ideologues, theorised and displayed alternative standards of assessment of Indian (art), craft and design and its adaptive leverage to groom the uneducated European view. With Samit Das, Priya Maholay Jaradi, Simryn Gill and Simon Soon.